Despite known dangers people still text or use their phones while walking, unable to see their pathways. People had been hit by vehicles, smacked right to a door or fell face flat on the road, but a girl learned her lesson after she had suffered humiliation. The girl fell and her right leg slipped in a storm drain. 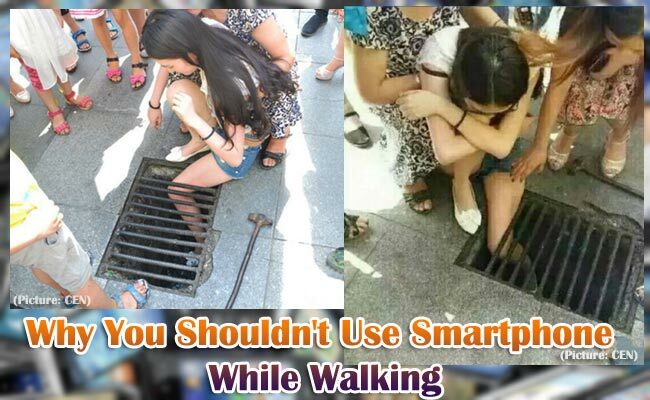 She was walking while texting a friend and did not notice the drain. Unfortunately, her leg was skinny enough to go all the way in and get stuck in a street of Mianyang City in China’s Sichuan Province. People gathered around to try to help while others took out their own phones and took a photo of her misery. The fire brigade had been called to free her leg. It took them 45 minutes to finally free the girl. According to the reports of Metro, the girl had very skinny legs which made her stuck in the first place. If she had larger legs, it might have been a lesser problem. Ming Lai of the fire brigade that responded the to the unnamed girl shared that the bars were removed and the girl was freed as soon as they came. The girl’s leg was scratched, numbed and a bit bruised due to being tightly squeezed for almost an hour but she quickly recovered without any need to be hospitalized.